Our September outing will give participants the opportunity to visit two gardens which are remarkable, both in terms of their design and theme as well as for their vast collection of plants and shrubs. Francis Peeters and Guy Vandesande, who present the weekly garden show on RTBF “Jardins et Loisirs”, will guide us through their 40 are “Amoena Garden” which they started laying out in 1999. 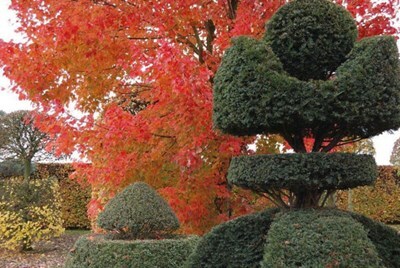 The garden is divided into several sections or “rooms” and contains a profusion of many different plants and shrubs from all parts of the world. We will go from one discovery to the next along a small path. We will enjoy the wonderful autumn shades of all sorts of fantastic grasses, the flamboyant colours of foliage and the amazing blooms of late season plants. Following our lunch we will discover the “Gardens of the World” in the “Domaine de Cambron”, starting our visit in the Chinese gardens with their exceptionnal design and diversity including the “Garden of the Holy Mountains”. We will continue our walk through the Australian section with its tree ferns and on to an African village garden. Finally, we will have ample time to admire an evocation of Indonesian terraced paddy fields. Mr. Guy Vandesande, the head gardener, will be our guide and will answer all your questions. Following our visit, which will end at 16.30, participants are invited to discover the other sections of the “ Domaine de Cambron “.